To Cite: Vilar Neto J D O, da Silva C A, Lima A B, Rosa de Souza F J, Pinto D V, et al. Effects of Low-Dose Creatine Monohydrate on Muscle Strength and Endurance, Asian J Sports Med. 2018 ; 9(3):e62739. doi: 10.5812/asjsm.62739. To investigate the effect of low-dose supplementation of creatine monohydrate without the use of the saturation phase, 36 male university students engaged in resistance training (age 22.5 ± 4.3 years, height 1.76 ± 0.08 m, weight 77.0 ± 11.0 kg, and body mass index 24.6 ± 2.5 kg/m2) were randomly divided into three groups: group placebo (GP), group supplemented with creatine 3 g/day (3G), and group supplemented with 5 g/day creatine (5G). The subjects were tested for maximum muscle strength (1RM), upper body muscle endurance (MPU), and abdominal muscle endurance (MSU) before and after 7, 14, 21, 28, and 35 days of creatine supplementation or placebo and performing standardized resistance training. After 35 days of supplementation and training, all groups showed a significant improvement in the 1RM test; however, the percentages of strength increase were significantly higher (P < 0.05) in the groups supplemented with creatine (G3, Δ% 1RM = 20.0 ± 4.0; G5, Δ% 1RM = 19.9 ± 1.5) than in the placebo group (GP, Δ% 1RM = 10.3 ± 1.9). Upper limb muscle endurance showed a significant improvement only in 5G, ranging from 39.9 ± 7.9 MPU/min to 50.7 ± 11.0 MPU/min after 35 days of supplementation. Interestingly, abdominal muscle endurance showed no increase in any of the groups (GP, P > 0.528; G3, P > 0.076; G5, P > 0.148). These results support a number of earlier studies that demonstrated that creatine supplementation at low doses and without the use of the loading phase are effective for increasing maximal strength and endurance of upper limbs. For at least 50 years, creatine is already well known to scientists and professional athletes (1). However, creatine supplementation with athletic intent began to gain popularity in the 1992 Olympics in Barcelona, when British sprinter Linford Christie won the 100-m dash and linked his gold medal to creatine intake (2). Creatine is a natural nutrient mainly found, in small amounts, in foods of animal origin (e.g., 2 g in 500 g of raw beef) (1) and is also endogenously synthesized in small amounts (1 g/day) by the liver, kidneys, and pancreas from the amino acids glycine, methionine, and arginine (3, 4). In a standard omnivorous diet with an intake of 1 - 2 g of creatine per day, the intramuscular creatine stores are between 60 and 80% saturated. Therefore, creatine monohydrate supplementation aims to saturate the remaining 20 to 40% (5). Oral creatine monohydrate supplementation could increase the total amount of muscle creatine, which in turn could also increase free creatine and phosphocreatine (PCr) (1, 6). Previous studies showed that administration of 20 g/day of creatine for 5 - 6 days could significantly increase performance at maximal exercise and increase body weight by 0.5 - 1.0 kg (7-11). When this high dose of creatine was sustained for 28 days, body weight gain reached 1.7 kg (12). The suggested dose of 20 g/day for 5 days, commonly called the “loading phase,” followed by the “maintenance phase,” with doses between 5 and 10 g/day make up the most popular creatine administration protocol among athletes (12, 13). Burk et al. investigated the effect of low and continuous doses of creatine and demonstrated that administration of a low dose (7.7 g/day) for 21 days is sufficient to increase strength, potency, and fatigue resistance in male college athletes compared with the control group (14). However, the efficacy of low-dose creatine monohydrate supplementation has no absolute consensus in the scientific world. Some studies failed to demonstrate any improvement in maximal strength, potency, or muscle endurance in subjects on low-dose creatine monohydrate supplementation (15-19). For example, no increase in muscle creatine concentration and no anaerobic muscle metabolism improvement were found in swimmers supplemented with 2 g of creatine per day for a period of 6 weeks (18). Similarly, 6 g/day of creatine administered for 6 days was also not sufficient to improve muscle power (Wingate test) in 40 active men (20). Moreover, Lobo et al. investigated the effects of 1-year creatine supplementation (1 g/day) on bone health, lean mass, and muscle function in 109 older postmenopausal women using a double-blind, placebo-controlled, parallel-group study design. Muscle function was measured by timed up and go and timed-stands tests. No improvement was found after 1 year of supplementation (17). Thus, unlike the saturation protocol, the ergogenic benefits of low and continuous dose supplementation of creatine have not yet been fully elucidated, and issues such as dose, minimum time of use, and influence of resistance training during supplementation remain the subjects of doubt and questions in the scientific and sports field. This is a randomized, double-blind, placebo-controlled clinical trial involving 36 healthy men engaged in resistance training. All participants were informed about the risks and benefits involved in this study and signed a written informed consent before participating in the study. The subjects were divided into three groups in a randomized, double-blind fashion as follows: group G3 (3 g/day creatine supplementation), group G5 (5 g/day creatine supplementation); and group GP (supplementation with placebo, a compound of inert substance with color, solubility, and taste similar to those of creatine, using a dose of 5 g/day). During the study period, all subjects performed a standardized resistance training program and were advised to avoid alcohol consumption and not to change their food intake habits. Thirty-six male students engaged in resistance training participated in this study. Mean age was 22.5 ± 4.3 years, height 1.76 ± 0.08 meters, weight 77.0 ± 11.0 kg, and body mass index (BMI) 24.6 ± 2.5 kg/m2. The participants performed the resistance training in a systematic and assiduous manner at least 6 months before the commencement of the study. Inclusion criteria included the following: not using any central nervous system stimulants; no personal history of cardiovascular, kidney, or liver disease; no injuries or pain in the shoulders or elbows; and not taking any supplements that contained creatine in the last 60 days. Six participants who did not fully observe the training protocol or perform all required tests were excluded. This study was registered with the certificate of presentation for ethical appreciation (no. 52825816.9.0000.5045) and was approved by the Ethics and Research Committee (appraisement report number 1690479). All the determinations of resolution 466/12 of the National Health Council, which deals with the guidelines and norms regulating research involving humans in Brazil, were verified. The total intervention time was 6 weeks, with the first week being aimed at familiarizing the physical tests and the adaptation to the resistance training program. Over the next 5 weeks (35 days), the participants underwent a standardized resistance training and had a daily intake of creatine or placebo. All study participants were instructed to maintain their food intake habits and not to consume any type of dietary supplements during the study period. To establish a baseline, physical tests were performed shortly after the week of familiarization and before the beginning of creatine supplementation or placebo. The tests were repeated at the end of each week (7 days) for 5 weeks to evaluate the effect of creatine supplementation on maximal strength and fatigue resistance over time. A supplement in the form of powder containing 100% of micronized creatine monohydrate, supplied by a company of notoriety in Brazil, was used. The supplier guarantees the purity of the product based on high-performance liquid chromatography test. Creatine and placebo were prepared (36 kits with 35 sachets each). The kits and sachets were identical and were subsequently coded. The relationship between the code and the composition of the sachets in each kit were known only by the pharmacy school. All groups had the supplementation for 35 days (one sachet per day, taken at their convenience). The participants were instructed to mix and dissolve the contents of the sachet in 200 mL of water before drinking the solution. Repeating the process to ensure intake of remnants that were still impregnated in the glass. All subjects were tested for strength (one maximal bench press repetition, 1RM), upper body resistance (maximal push-ups in 1 minutes, MPU), and abdominal resistance (maximal sit-ups in 1 minutes, MSU). The tests were performed after the familiarization week, i.e., before the beginning of supplementation and at the end of each week (7 days) for 5 weeks (POST 7D, POST 14D, POST 21D, POST 28D, and POST 35D). All tests were performed under the supervision of a trainer with a degree in Physical Education, with specialization in Biomechanics and Physiology and over 20 years of experience in resistance training. Subjects performed the 1RM test, wherein the maximum amount of weight (in kilograms) that can be lifted during the performance of a standardized exercise, with the perfect technique of execution, is determined. In this study, we used bench press. Bench press exercises were performed on an articulated machine, which was set for maximum range of movement. After the warm-up for the muscles and joints involved in the exercise, the subject was properly positioned on the equipment, and after receiving a lift-off from two spotters, the subject lowered the machine towards his chest, paused briefly, and pressed the machine to full forearm extension. The loads were identified during the familiarization week; however, for the 1RM test, we applied increasing loads until the subject could not complete a repetition with full range of motion. When necessary, the trials were performed with lighter loads until the 1RM was determined (maximum of five trials). Five minutes of rest was allowed between trials. Upper body muscle endurance was assessed by the MPU test. The subjects completed as many push-ups as they could in 60 second. After 5 minutes of warm-up, the subjects started with the standard “up” position, with the body taut and straight, the hands positioned shoulder-width apart, the fingers pointed forward, and the elbows extended. At the “attention, go!” command, the subjects flexed their elbows, bringing the thorax about 5 cm close to the ground; the body should not come in contact with the ground, except the palms of the hands and feet. Moreover, the elbow joint should form a minimum angle of 90° and, subsequently, fully extend again. The body should remain straight during the test. The subjects were allowed to rest; however, only full and perfect repetitions were recorded. The maximal sit-up (MSU) test was used to assess the endurance of the abdominal muscles. After 5 minutes of warm-up, the subjects were in the dorsal decubitus position, with the elbows, shoulders, trunk, hip, and knees extended (initial position). At the “attention, go!” command, the subjects flexed their trunk, hip, and knees, assuming a sitting position, and touched their knees with their elbows (final position). Thereafter, the subject assumes the initial position. They completed as many repetitions as possible within 60 seconds. Rest was allowed in the down position. Similar to the push-up test, only full and perfect repetitions were counted. To avoid any uncontrolled variables in the resistance training during the 35 days of supplementation, all subjects had an identical resistance training program, i.e., a standardized resistance training was provided to the subjects to ensure that they receive the same exercise stimulus. Moreover, the training sessions were performed within the same facility and were supervised by an experienced coach. For all exercises, the subjects performed 2 sets of 20 repetitions as localized warm-up, followed by 4 sets of 8 to 10 repetitions. The subjects were also instructed to select a load that would enable them to perform a minimum of 7 repetitions; when the repetitions exceed 10, the load was increased. Normal data distribution was confirmed using the Kolmogorov-Smirnov test. A simple one-way analysis of variance (ANOVA) between groups for the pre-supplementation scores indicated that all dependent variables in the GP, G3 and G5 groups were statistically equal (P > 0.05) at baseline, thereby suggesting that the group randomization was effective in providing equivalent baseline scores across the groups. Paired samples t-tests were used to identify significant differences between pre- and post-supplementation scores for 1RM, MPU, and MSU. 1RM test was analyzed using the percent change (%Δ). The values were compared between groups using Student’s t-test. P < 0.05 was considered statistically significant for all comparisons. Statistical analyses were performed using SPSS v. 20.0 (SPSS Inc., Chicago, IL). Table 1 shows the characteristics of the groups prior to supplementation. Weight, age, height, BMI, maximal muscle strength, fatigue resistance of the upper limbs, and resistance to abdominal muscle fatigue showed no significant differences between the groups (P > 0.05). Abbreviations: Hom, test of homogeneity of variances; MPU, maximum push-up; MSU, maximum sit-up; RM, repetition maximum. Figure 1 shows the values obtained in the 1RM test (pre-supplementation and after 35 days of supplementation). Paired t-test showed that the maximal muscle strength increased significantly in all groups (P < 0.05); thus, the results in the supplemented groups were not different from those of the placebo group. 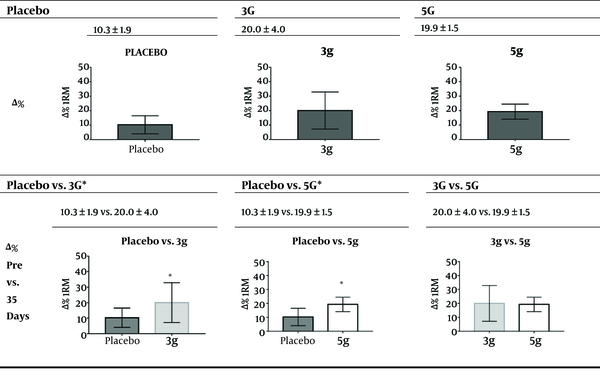 However, when we evaluated the percentage increase of strength (Figure 2), groups 3G and 5G had a significantly higher percentage of strength increase than the placebo group (G3, Δ% 1RM = 20.0 ± 4.0 and G5, Δ% 1RM = 19.9 ± 1.5 vs. GP, Δ% 1RM = 10.3 ± 1.9; GP vs. 3G and GP vs. 5G, P < 0.05). Nevertheless, no significant difference in the percentage of strength increase between the groups supplemented with creatine was found (3G vs. 5G, P > 0.05). When assessing the increase in maximal strength over time (Table 2), we found that unlike the placebo group, which only showed a significant increase after 14 days, the groups supplemented with creatine (5 and 3 g/day) showed significant increases in the expression of maximal strength shortly after 7 days of supplementation. Abbreviations: MPU, maximum push-up; RM, repetition maximum. Figure 1. Effect of creatine supplementation. RM, repetition maximum; MSU, maximum sit-up; MPU, maximum push-up. *Significantly different from Pre. No difference between the groups (one-way ANOVA). Values are express as mean ± SD. Figure 2. Δ% 1RM test. *Significantly different from the other group. Values are express as mean ± SD. Δ% were calculated as follows: (Post/Pre) - 1. Based on the MPU values described in Figure 1, no significant difference between the pre-supplementation and after 35 days of supplementation in GP and 3G exists; however, in 5G, significant differences were observed (pre-supplementation, 39.9 ± 7.9 vs. after 35 days of supplementation, 50.7 ± 11.0) (one-way ANOVA, P < 0.05). Interestingly, different from maximal strength evaluation, the 5G group was only able to show significant increases in upper limb muscle resistance after 14 days of supplementation versus 7 days for 1 RM. (Table 2). Paired t-test showed no significant difference in the values before and after 35 days of supplementation in any of the groups (Figure 1). Creatine supplementation did not result in any improvement in abdominal muscle endurance. Creatine supplementation using the standard protocol, i.e., 5 days of saturation phase followed by maintenance phase, is effective for the improvement of performance related to anaerobic power, strength, and muscular endurance (9, 11, 21-23). However, conflicting data with regard to the effect of creatine supplementation without a “loading phase” and using low doses exist (15-19). Aedma et al., in a double-blind, placebo-controlled, parallel-group study, showed that in 20 trained wrestlers whose age, weight, height, and body fat percentage were 25.6 ± 3.8 years, 82.7 ± 8.6 kg, 185.1 ± 6.5 cm, and 16.1 ± 2.4 % (mean ± SD), respectively, no improvement in upper body anaerobic power in anaerobic tests mimicking wrestling matches was observed after creatine supplementation (0.3 g/kg of body weight/day for 5 days) (19) Similarly, Wilder et al. investigated creatine ergogenic effects in 25 highly trained male collegiate football players (age, 19 ± 1.02 years; height, 185.8 ± 5.27 cm; weight, 100.89 ± 21.79 kg) with at least 1 year of playing experience. The maximal strength of the supplemented group (3 g/day of creatine) was assessed using the 1RM test (back-squat exercises); the subjects were evaluated before (week 0), during (week 5), and after supplementation (week 10), and the results showed no improvement in maximal strength (15). Our results demonstrated that creatine supplementation in low doses (i.e., 3 and 5 g/day), even without the use of saturation phase (i.e., 20 g/day for 5 - 7 days), could be effective in increasing maximal muscle strength and fatigue resistance. Although the placebo group also showed a significant increase in maximal strength, the percentage of increase in strength was significantly greater in the supplemented groups than in the placebo group. 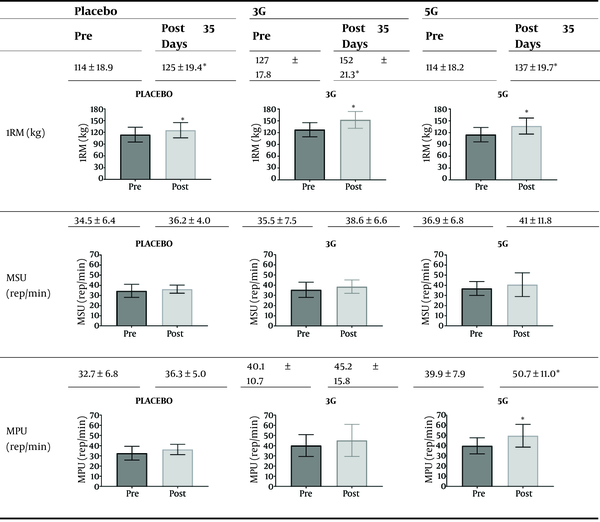 Considering the time variable, the supplemented groups showed significant results after 7 days, whereas the placebo group showed significant results after 14 days. Moreover, the maximal strength increase in the placebo group, which could be lower than that in the supplemented groups, could be attributed to the natural and physiological adaptation to resistance training (24, 25). For the upper limb resistance to fatigue, significant results were found only in the group supplemented with 5 g/day of creatine (P < 0.05) and only after 14 days. Similar results were found by Camic et al., who investigated the maximal strength and endurance using bench press in 77 university men (mean age, 22.1 ± 2.5 years; weight, 81.7 ± 8.4 kg) in a double-blind, placebo-controlled, randomized clinical trial. However, unlike our study, the participants were untrained and used a creatine supplement with a polyethylene glycol compound (1.25 and 2.50 g/day for >30 days). They also found that the placebo group had a significant increase in maximum strength; however, only the groups supplemented with creatine showed improvement in resistance to upper limb fatigue (26). Furthermore, it is interesting to note that no statistical difference in the maximum force between the supplemented groups was noted. However, improvement in the resistance to upper limb fatigue was observed only in the group supplemented with 5 g/day and only after 14 days. We could speculate that for activities with a longer duration, a higher dose and longer supplementation duration are required to obtain a significant increase in performance. Interestingly, abdominal muscle endurance showed no improvement in any of the groups (GP, P > 0.528; G3, P > 0.076; G5, P > 0.148). This finding could be attributed to the characteristics of the muscle group, mainly consisting of type 2 muscle fibers, which are naturally oxidative and resistant to fatigue (27, 28). Moreover, our sample was composed of individuals with at least 6 months of previous training; thus, most likely, the muscle group already had high fatigue resistance. From a biochemical and physiological point of view, the ergogenic effect of creatine could be explained by the fact that the energy required for muscle contraction is provided by the breakdown of adenosine triphosphate (ATP) from the enzyme ATPase. The result of the reaction, which is extremely fast, is adenosine diphosphate (ADP), which is rapidly regenerated by the phosphocreatine (PCr) through another enzyme, i.e., creatine kinase (5, 29). Thus, creatine is a vital source of chemical energy for muscle contraction because of its capacity for phosphorylation, with the consequent formation of PCr and reversion and with the donation of the phosphate group to ADP, which in turn gives rise to a new ATP. Moreover, creatine is a fast source of energy for the synthesis and re-synthesis of ATP and is thus extremely important for high-intensity and short-duration activities (1). In terms of administration protocols, a loading phase of 20 g/day for 5 days followed by a maintenance phase of 2 or 3 g/day is common for creatine monohydrate (5, 16). The saturation phase is used to achieve an adequate increase in muscle creatine stores. In this sense, Hultman et al. investigated the effect of two oral creatine supplementation protocols on muscle tissue saturation. The typical saturation protocol (20 g/day for 6 days) increased the amount of creatine in muscle tissue by 20%. The low and continuous dose protocol (3 g/day for 28 days) also provided an approximately 20% increase in muscle creatine stores. The elevated levels of muscle creatine were sustained in both cases with a maintenance dose of 2 g/day (30). Therefore, our results corroborate other findings (14, 20, 21, 31-35), i.e., low doses of creatine monohydrate supplementation, regardless of the use of saturation phase, could significantly increase maximum muscle strength and resistance to fatigue. Furthermore, no subjects in any of the groups reported any discomfort or side effects during the study period. The results of this study indicate that creatine supplementation in low doses could also provide its ergogenic benefits without the need of the saturation phase. Moreover, doses of 3 and 5 g/day are sufficient and do not differ from each other in terms of maximal strength increment after 7, 14, 21, 28, and 35 days of supplementation. However, for fatigue resistance, a higher dose (5 g/day) for a minimum of 14 days seems to be necessary for a significant improvement. These findings are particularly significant for athletes with little preparation time for a competition or for those who have some contraindication to prolonged use and high doses of creatine, thereby benefitting from low-dose creatine supplementation at 7 or 14 days before competitions. Conflicts of Interests: No conflicts of interest are declared by the authors. Funding/Support: No funding was received for the study. 1. Williams MH, Branch JD. Creatine supplementation and exercise performance: an update. J Am Coll Nutr. 1998;17(3):216-34. doi: 10.1080/07315724.1998.10718751. [PubMed: 9627907]. 2. Poortmans JR, Francaux M. Adverse effects of creatine supplementation: fact or fiction? Sports Med. 2000;30(3):155-70. doi: 10.2165/00007256-200030030-00002. [PubMed: 10999421]. 3. Gualano B, Ugrinowitsch C, Novaes RB, Artioli GG, Shimizu MH, Seguro AC, et al. Effects of creatine supplementation on renal function: a randomized, double-blind, placebo-controlled clinical trial. Eur J Appl Physiol. 2008;103(1):33-40. doi: 10.1007/s00421-007-0669-3. [PubMed: 18188581]. 4. Culpepper RM. Creatine supplementation: safe as steak? South Med J. 1998;91(9):890-2. [PubMed: 9743068]. 5. Kreider RB, Kalman DS, Antonio J, Ziegenfuss TN, Wildman R, Collins R, et al. International Society of Sports Nutrition position stand: safety and efficacy of creatine supplementation in exercise, sport, and medicine. J Int Soc Sports Nutr. 2017;14:18. doi: 10.1186/s12970-017-0173-z. [PubMed: 28615996]. [PubMed Central: PMC5469049]. 6. Persky AM, Rawson ES. Safety of creatine supplementation. Subcell Biochem. 2007;46:275-89. doi: 10.1007/978-1-4020-6486-9_14. [PubMed: 18652082]. 7. Balsom PD, Ekblom B, Söerlund K, Sjödln B, Hultman E. Creatine supplementation and dynamic high-intensity intermittent exercise. Scand J Med Sci Sports. 2007;3(3):143-9. doi: 10.1111/j.1600-0838.1993.tb00378.x. 8. Greenhaff PL, Bodin K, Soderlund K, Hultman E. Effect of oral creatine supplementation on skeletal muscle phosphocreatine resynthesis. Am J Physiol. 1994;266(5 Pt 1):E725-30. doi: 10.1152/ajpendo.1994.266.5.E725. [PubMed: 8203511]. 9. Stroud MA, Holliman D, Bell D, Green AL, Macdonald IA, Greenhaff PL. Effect of oral creatine supplementation on respiratory gas exchange and blood lactate accumulation during steady-state incremental treadmill exercise and recovery in man. Clin Sci (Lond). 1994;87(6):707-10. doi: 10.1042/cs0870707. [PubMed: 7874863]. 10. Birch R, Noble D, Greenhaff PL. The influence of dietary creatine supplementation on performance during repeated bouts of maximal isokinetic cycling in man. Eur J Appl Physiol Occup Physiol. 1994;69(3):268-76. doi: 10.1007/BF01094800. [PubMed: 8001541]. 11. Greenhaff PL, Casey A, Short AH, Harris R, Soderlund K, Hultman E. Influence of oral creatine supplementation of muscle torque during repeated bouts of maximal voluntary exercise in man. Clin Sci (Lond). 1993;84(5):565-71. doi: 10.1042/cs0840565. [PubMed: 8504634]. 12. Earnest CP, Snell PG, Rodriguez R, Almada AL, Mitchell TL. The effect of creatine monohydrate ingestion on anaerobic power indices, muscular strength and body composition. Acta Physiol Scand. 1995;153(2):207-9. doi: 10.1111/j.1748-1716.1995.tb09854.x. [PubMed: 7778463]. 13. Vandenberghe K, Goris M, Van Hecke P, Van Leemputte M, Vangerven L, Hespel P. Long-term creatine intake is beneficial to muscle performance during resistance training. J Appl Physiol (1985). 1997;83(6):2055-63. doi: 10.1152/jappl.1997.83.6.2055. [PubMed: 9390981]. 14. Burke DG, Silver S, Holt LE, Smith Palmer T, Culligan CJ, Chilibeck PD. The effect of continuous low dose creatine supplementation on force, power, and total work. Int J Sport Nutr Exerc Metab. 2000;10(3):235-44. doi: 10.1123/ijsnem.10.3.235. [PubMed: 10997950]. 15. Wilder N, Deivert RG, Hagerman F, Gilders R. The Effects of Low-Dose Creatine Supplementation Versus Creatine Loading in Collegiate Football Players. J Athl Train. 2001;36(2):124-9. [PubMed: 12937451]. [PubMed Central: PMC155521]. 16. Wilder N, Gilders R, Hagerman F, Deivert RG. The effects of a 10-week, periodized, off-season resistance-training program and creatine supplementation among collegiate football players. J Strength Cond Res. 2002;16(3):343-52. doi: 10.1519/00124278-200208000-00003. [PubMed: 12173947]. 17. Lobo DM, Tritto AC, da Silva LR, de Oliveira PB, Benatti FB, Roschel H, et al. Effects of long-term low-dose dietary creatine supplementation in older women. Exp Gerontol. 2015;70:97-104. doi: 10.1016/j.exger.2015.07.012. [PubMed: 26192975]. 18. Thompson CH, Kemp GJ, Sanderson AL, Dixon RM, Styles P, Taylor DJ, et al. Effect of creatine on aerobic and anaerobic metabolism in skeletal muscle in swimmers. Br J Sports Med. 1996;30(3):222-5. doi: 10.1136/bjsm.30.3.222. [PubMed: 8889115]. [PubMed Central: PMC1332335]. 19. Aedma M, Timpmann S, Latt E, Oopik V. Short-term creatine supplementation has no impact on upper-body anaerobic power in trained wrestlers. J Int Soc Sports Nutr. 2015;12:45. doi: 10.1186/s12970-015-0107-6. [PubMed: 26664350]. [PubMed Central: PMC4673838]. 20. Hoffman JR, Stout JR, Falvo MJ, Kang J, Ratamess NA. Effect of low-dose, short-duration creatine supplementation on anaerobic exercise performance. J Strength Cond Res. 2005;19(2):260-4. doi: 10.1519/15484.1. [PubMed: 15903359]. 21. Claudino JG, Mezencio B, Amaral S, Zanetti V, Benatti F, Roschel H, et al. Creatine monohydrate supplementation on lower-limb muscle power in Brazilian elite soccer players. J Int Soc Sports Nutr. 2014;11:32. doi: 10.1186/1550-2783-11-32. [PubMed: 24991195]. [PubMed Central: PMC4077550]. 22. Larson-Meyer DE, Hunter GR, Trowbridge CA, Turk JC, Ernest JM, Torman SL, et al. The effect of creatine supplementation on muscle strength and body composition during off-season training in female soccer players. J Strength Cond Res. 2000;14(4):434-42. doi: 10.1519/00124278-200011000-00011. 23. Mujika I, Padilla S, Ibanez J, Izquierdo M, Gorostiaga E. Creatine supplementation and sprint performance in soccer players. Med Sci Sports Exerc. 2000;32(2):518-25. doi: 10.1097/00005768-200002000-00039. [PubMed: 10694141]. 24. Kraemer WJ, Fleck SJ, Evans WJ. Strength and power training: physiological mechanisms of adaptation. Exerc Sport Sci Rev. 1996;24:363-97. [PubMed: 8744256]. 25. Assumpcao CO, Tibana RA, Viana LC, Willardson JM, Prestes J. Influence of exercise order on upper body maximum and submaximal strength gains in trained men. Clin Physiol Funct Imaging. 2013;33(5):359-63. doi: 10.1111/cpf.12036. [PubMed: 23701174]. 26. Camic CL, Housh TJ, Zuniga JM, Traylor DA, Bergstrom HC, Schmidt RJ, et al. The effects of polyethylene glycosylated creatine supplementation on anaerobic performance measures and body composition. J Strength Cond Res. 2014;28(3):825-33. doi: 10.1519/JSC.0b013e3182a361a5. [PubMed: 23897021]. 27. David P, Mora I, Perot C. Neuromuscular efficiency of the rectus abdominis differs with gender and sport practice. J Strength Cond Res. 2008;22(6):1855-61. doi: 10.1519/JSC.0b013e31817bd529. [PubMed: 18978621]. 28. Learman K, Pintar J, Ellis A. The effect of abdominal strength or endurance exercises on abdominal peak torque and endurance field tests of healthy participants: A randomized controlled trial. Phys Ther Sport. 2015;16(2):140-7. doi: 10.1016/j.ptsp.2014.08.009. [PubMed: 25481694]. 29. Herda TJ, Beck TW, Ryan ED, Smith AE, Walter AA, Hartman MJ, et al. Effects of creatine monohydrate and polyethylene glycosylated creatine supplementation on muscular strength, endurance, and power output. J Strength Cond Res. 2009;23(3):818-26. doi: 10.1519/JSC.0b013e3181a2ed11. [PubMed: 19387397]. 30. Hultman E, Soderlund K, Timmons JA, Cederblad G, Greenhaff PL. Muscle creatine loading in men. J Appl Physiol (1985). 1996;81(1):232-7. doi: 10.1152/jappl.1996.81.1.232. [PubMed: 8828669]. 31. Lanhers C, Pereira B, Naughton G, Trousselard M, Lesage FX, Dutheil F. Creatine Supplementation and Upper Limb Strength Performance: A Systematic Review and Meta-Analysis. Sports Med. 2017;47(1):163-73. doi: 10.1007/s40279-016-0571-4. [PubMed: 27328852]. 32. Lanhers C, Pereira B, Naughton G, Trousselard M, Lesage FX, Dutheil F. Creatine Supplementation and Lower Limb Strength Performance: A Systematic Review and Meta-Analyses. Sports Med. 2015;45(9):1285-94. doi: 10.1007/s40279-015-0337-4. [PubMed: 25946994]. 33. Candow DG, Little JP, Chilibeck PD, Abeysekara S, Zello GA, Kazachkov M, et al. Low-dose creatine combined with protein during resistance training in older men. Med Sci Sports Exerc. 2008;40(9):1645-52. doi: 10.1249/MSS.0b013e318176b310. [PubMed: 18685526]. 34. Yanez-Silva A, Buzzachera CF, Picarro IDC, Januario RSB, Ferreira LHB, McAnulty SR, et al. Effect of low dose, short-term creatine supplementation on muscle power output in elite youth soccer players. J Int Soc Sports Nutr. 2017;14:5. doi: 10.1186/s12970-017-0162-2. [PubMed: 28190980]. [PubMed Central: PMC5296953]. 35. Rawson ES, Stec MJ, Frederickson SJ, Miles MP. Low-dose creatine supplementation enhances fatigue resistance in the absence of weight gain. Nutrition. 2011;27(4):451-5. doi: 10.1016/j.nut.2010.04.001. [PubMed: 20591625].